But that’s not entirely true. For the first three centuries all Christians knew that Jesus taught nonviolence. Prior to Constantine the Old Testament text most frequently quoted by the Church Fathers was Isaiah 2:4 — a messianic prophecy that says in the age of Messiah swords and spears will be turned into plows and pruning hooks, and that the study of war will be abandoned. The early Christians believed that Isaiah’s prophecy spoke of Jesus, and that with his death, burial, and resurrection the peaceable kingdom Christians are to inhabit had been inaugurated. The most quoted New Testament text by the Ante-Nicene Fathers was Matthew 5:44 — “Love your enemies.” In that same passage Jesus says this: “You have heard it said, ‘An eye for an eye and a tooth for a tooth.’ But I say to you, Do not resist the evildoer. But if anyone strikes you on the right cheek, turn the other also.” (Matthew 5:38–39) Thus the earliest Christians believed what Jesus believed about violence — that violence belongs to the old age that is passing away with the arrival of the kingdom of God. We can say it this way: The biblical test case for love of God is love of neighbor; the biblical test case for love of neighbor is love of enemy. And you can’t love your neighbor-enemy by using a sword, a gun, or a hydrogen bomb against them. But if you don’t agree with what Jesus believes about violence, you can always (ab)use the Bible to find an out. For example you could cite 1 Samuel 15:3 to refute Jesus. That’s how you (ab)use the violent passages of the Bible to silence Jesus. Yes, the Bible is a violent book, but not because God is violent; rather the Bible is violent because we are violent, and the problem of violence is unflinchingly depicted in the Bible. We all know there’s lots of killing in the Bible. Moses killed enemies. Joshua killed enemies. David killed enemies. Elijah killed enemies. Nothing new with that — that’s the way the world has always been. The most ancient “solution” for evil is to “kill the bad guys.” But when we get to Jesus, he tells us to stop killing our enemies and to love them. Maybe you want to be a Mosian or a Joshuian or a Davidian or a Elijian…but me, I’m trying to be a Christian. So as much as I might like the idea of killing my enemies, if I’m trying to be a Christian I can’t use Joshua to save me from Jesus. And Jesus calls me to lay down my sword and take up my cross. Christians are called to imitate the one who was willing to die for that which he was unwilling to kill. Jesus did not arm his disciples so they could fight; Jesus armed his disciples so that prophecy would be fulfilled and so he could disarm them! 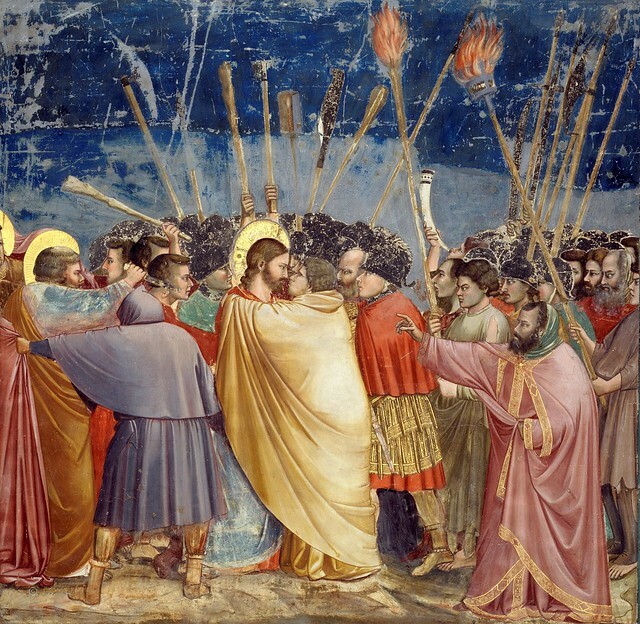 Jesus allowed those arresting him to falsely assume he was a violent revolutionary (as the prophecy in Isaiah says); but when his disciples actually attempted to employ violence, Jesus stopped them. Because the kingdom of Christ doesn’t come from the bloody world of war, Jesus disarmed his disciples in the Garden of Gethsemane. A garden is no place for swords and spears anyway. Gardens are where we employ plows and pruning hooks. Followers of Jesus are called to be gardeners and healers, not combatants and killers. At least that’s what the church originally believed.